From our friends at Occupy: ideas for activists for the festive season. Forget Jack the Ripper and the London Dungeons, we show you the murky side of the capital’s more recent past. 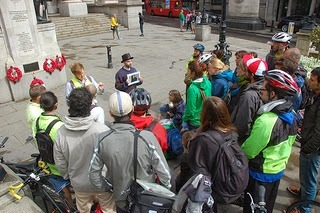 Occupy London Tours is a free alternative tour company, run by volunteers, who want to throw open the secretive world of finance and politics for all to see. 4th January, afternoon. Approx. 2 hours. Meet at St Paul’s Cathedral steps. Ends opposite Liverpool St Station. We tell the story of the UK’s smallest city (really! ), the history of money in the heart of London and the Square mile’s role in the financial crisis of 2007/8. Find out just what the Corporation of London actually is, why the Queen has to ask permission to enter the City and why the ‘Black-Scholes equation’ matters to you! 23rd January, evening. Approx. 1.5 hours. Meet Canary Wharf tube, main exit (Banker’s Plaza). The tours are designed to be informative, entertaining and - most importantly - accessible. Our aim to is to enable people from London, the UK and all over the world to engage with the financial system and its impact on their lives. We de-mystify this secretive and badly understood world through colourful stories, secret histories, rock-solid facts and figures, pavement art, games - and even our very own collateralised-debt-obligation rap (!). The tours offer a critique of the status quo without being politically affiliated. Attendees often join us in the pub afterwards to carry on the conversation. Kenya – A Haven for Dirty Money?